Solgar 7 is a unique formulation which structurally supports collagen building blocks, while supporting the body`s range of natural motion & flexibility. 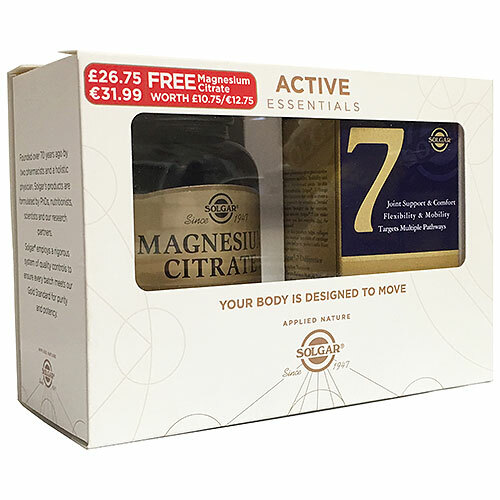 Magnesium Citrate is a high potency and highly absorbable form of the mineral magnesium. Next generation after Glucosamine. Solgar 7 works differently from Glucosamine or Chondroitin. While traditional joint-health formulas focus on cartilage support, Solgar 7 targets multiple pathways to balance joint stressors, structurally support collagen building blocks and sensitive joint cartilage...whilst simultaneously supporting the body`s natural range of motion and joint flexibility. Vitamin C (as Ester-C, calcium L-ascorbate), Boswellia (Boswellia serrata) Extract (resin) (as 5-Loxin Advanced), Vegetable Capsule Shell: hydroxypropylmethyl cellulose, Turmeric Root (Curcuma longa) Extract (4:1, equivalent to 200mg of root), Bulking Agent: maltodextrin, UC-II Standardised Cartilage (providing 10mg Undenatured Type II Collagen), White Willow Bark (Salix alba) Extract (5:1, equivalent to 175 mg of bark), Ginger Root (Zingiber officinale) Extract (4:1, equivalent to 140 mg of root), Anti-caking Agents: silicon dioxide, vegetable magnesium stearate, Pepper Spice Complex: Cayenne Powder (Capsicum annuum [fruit]), Bioperine (Black Pepper Extract) (Piper nigrum [fruit]). Magnesium (as citrate), Bulking Agents (microcrystalline cellulose, dicalcium phosphate), Anti-caking Agents (silicon dioxide, vegetable magnesium stearate) Glazing Agents (hydroxypropylmethyl cellulose, vegetable glycerin (from palm kernel oil and coconut oil)) Cellulose Gum, Colour (titanium dioxide). Take one vegicap daily or as directed by a healthcare practitioner. As a food supplement for adults take two (2) tablets daily, preferably at mealtime, or as directed by a healthcare practitioner. Below are reviews of Solgar 7 30 Caps with Free Magnesium Citrate 60 Caps - Best before date is 31st May 2019 by bodykind customers. If you have tried this product we'd love to hear what you think so please leave a review. So far so good and I'll probably try them again. The Magnesium is very relaxing .